The Culinary Gadabout: California Wine Month Celebrations! 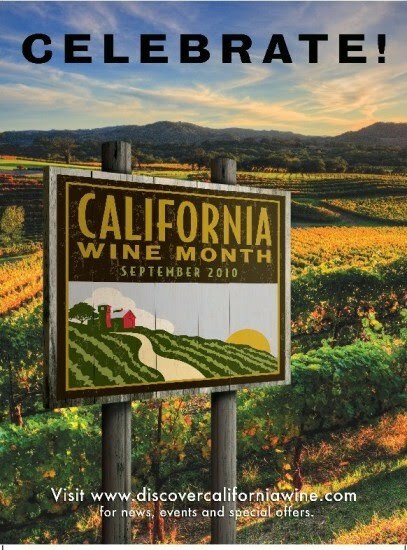 September is California Wine Month, and many of the Golden State's wineries, winegrape growers, wine region hotels, and related venues are hosting special events and/or providing discounts (you can see an list of many events here). The month kicks off over Labor Day weekend with Sonoma Wine Country Weekend, which has been named one of the 10 Best Wine & Food Events in the U.S. The weekend features more than 200 award winning wineries and chefs showcasing their talents, as well as wine seminars, cooking demonstrations and vineyard tours. San Luis Obispo: Several downtown hotels will be offering tasting and touring packages of the area. These include the Sands Inn & Suites Vineyard Limo Tour Package; Courtyard Marriott's Wine Tasting with Wine Line Tours Package; and Embassy Suites' Wine Wrangler Tour Package. September 3: Tolosa Winery “Friday Focus Tasting: Pinot Noir"
Monterey: The oceanfront Spindrift Inn is offering the wine-themed Sea Breeze Sipping Package in conjunction with award-winning Scheid Vineyards. The one-night wine-lovers package includes oceanfront or Cannery Row views, a bottle of Scheid’s ’07 Pinot Noir, two complementary tasting passes at Scheid’s Cannery Row Wine Lounge, and continental breakfast delivered in-room on a silver tray. Available only during September, the package starts at $199 for Cannery Row views and $269 for ocean views. The Santa Cruz Wine Trail to the Sea (Sept. 7-10) features exclusive tastings, a Roaring Camp Railroads tour of the redwood forests with picnic lunch accompanied by local wines, guided tours and winemaker dinners. The Capitola Art & Wine Festival (Sept. 11-12) will feature more than 150 artists, 20 wineries, music and food at the charming seaside community of Capitola Village. Free Napa Valley Vintners TweetUp tastings will be at Nectar Wine Lounge in San Francisco (Sept. 15) and at BottleRock in Los Angeles (Sept. 21) with hosted wine and appetizers. At the first-ever Temecula Valley Wine & Culinary Showcase (Sept. 17), wine lovers can enjoy the delicious products of local winery owners and mingle with winemakers, growers and chefs. On the 18th, the Ultimate Sierra Foothills Wine Tasting Experience in Danville presents several regions at once with more than 40 participating wineries from Amador, El Dorado and Calaveras counties. The 7th Annual Taste of the Central Coast (Sept. 19) in Arroyo Grande near Pismo Beach offers the wares of more than 40 leading restaurants and wineries, as well as live jazz music. Towards month's end, check out the Taste of Lodi Wine Camp (Sept. 25) and the 9th Annual Taste of Lodi festival (Sept. 26) just south of Sacramento. The wine camp is a rare opportunity for consumers to immerse in the winemaking process from vineyard to bottle to wine glass.